Liverpool have reacquainted themselves with the business of winning trophies at Wembley. For a club with their ambitions, it has been too long and they will cherish the moments of jubilation that followed this latest reminder that, when it comes to penalty shootouts, they are only just behind Germany in terms of efficiency. This was the fifth time they have lifted a trophy because of their superiority from 12 yards and, in total, they have lost only two out of 13 shootouts. Some of the club's greatest moments have been shrouded in this form of high drama and it felt like they had been merely toying with everyone's emotions that they won despite missing their first two. 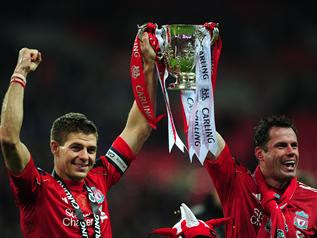 Steven Gerrard saw his effort turned on to the crossbar by Tom Heaton and when Charlie Adam shot wildly over the opportunity was there for Cardiff City, representing the Championship with distinction, to win their first trophy since 1927. When it really mattered, however, they could not hold their nerve. Don Cowie gave them the lead two rounds into the five but this was sandwiched by Kenny Miller and Rudy Gestede both hitting the post. Suddenly Liverpool found their composure, with Dirk Kuyt, Stewart Downing and Glen Johnson all scoring. Peter Whittingham beat Pepe Reina but the pressure was all too much for Anthony Gerrard as he walked up the end where Liverpool's fans were congregated. In different circumstances, he might have been sat there himself. This was a cruel moment for a man whose first football memories are of playing in the street where his older cousin, Steven, lived in Huyton, both wearing their Liverpool replica kits. His attempt to beat Reina was dragged hopelessly wide and Liverpool had their first trophy for six years and their first at Wembley since 1995. On the balance of play, it was well deserved even if Cardiff emerge with great dignity in defeat. For a good part of the match the Welsh club were threatening to become the first second-tier team to beat top-level opposition in a Wembley final since Sheffield Wednesday won this competition at Manchester United's expense 21 years ago. They led through Joe Mason's 19th-minute goal and, demonstrating great competitive strength, refused to accept defeat after Martin Skrtel turned in the equaliser on the hour and Dirk Kuyt gave Liverpool the lead they merited 18 minutes into extra time. There were only a couple of minutes left when Ben Turner poked in the goal from Whittingham's corner that took the game to penalties. Their effort could be accurately gauged by the sight of their captain, Mark Hudson, going down with cramp with almost 20 minutes of normal time still to play. Hudson produced a monumental performance and he was not alone. Aron Gunnarsson could barely run towards the end but still rose the highest to flick on Whittingham's corner for Turner's goal. A few moments earlier, Kuyt had cleared Filip Kiss's shot off the goalline. Malky Mackay's side defended stoutly, were well organised and strong in the tackle. They will also reflect on the moment, two minutes from the end of normal time, when Miller had the chance to win it. His first touch was exquisite, the shot was wild. That instance, with the goal begging, will stay with him for as long as his penalty miss. Yet Cardiff had done well just to be in the match at that point such was the unrelenting pressure they had to endure. It was difficult to keep count of the chances Liverpool created without making it a more difficult afternoon for Heaton. In many ways it has been the story of Liverpool's season and why their goals-per-chances ratio recently dipped below 9%, the least distinguished figures in the Premier League. They were clearly the superior team and, if they had made their possession count, they could have won with something to spare. Mason had beaten Reina with a low, diagonal shot after eluding José Enrique to run on to Miller's through ball and there were times in the first half when Kenny Dalglish's men looked frustrated. These moments quickly passed, though. Downing chose a good day to have one of his best games for Liverpool. 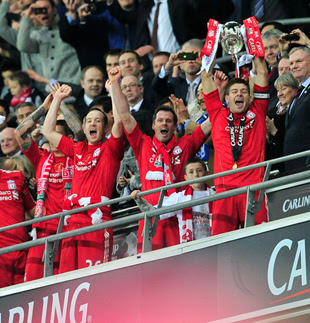 Gerrard was the key figure in midfield. Luis Suárez toiled away alongside Andy Carroll. Not everything they tried came off but they were a constant menace. Craig Bellamy was prominently involved after coming on as a 58th-minute substitute and the pressure was almost unremitting by the time, two minutes later, Carroll headed on Downing's corner, Suárez directed a twisting header against the post and Skrtel turned in the rebound. How crucial Miller's 88th-minute miss became. Kuyt, replacing a tiring Carroll, had been on the pitch five minutes when he broke through the inside-right channel and fired in a shot that came back to him off Anthony Gerrard. Off balance, the Dutchman was still able to beat Heaton with a first-time shot inside the near post. Ultimately, Turner's late, dramatic equaliser just made the defeat more harrowing for Cardiff. Liverpool were defending an immaculate record in cup final shootouts and, as one Gerrard lifted the trophy, another was on his knees.